Eaton 1-Phase 3-Wire Ring style meter pack has current rating of 125-Amps, voltage rating of 120/240-Volt AC and interrupt rating of 100-Kilo-Amps. It has aluminum bus that has horizontal bus rating of 200-Amps. This 2-Gang 4-jaw ring style meter pack has lug terminal connection. It features NEMA type 3R enclosure for added safety and strength. This ring style meter pack accommodates wire of size 6-AWG - 300-KCMIL, 6 - 2/0-AWG and 14 - 2-AWG. It measures 11.88-Inch x 6.38-Inch x 34.18-Inch. Ring style meter pack is suitable for use as service equipment and for indoor/outdoor use. 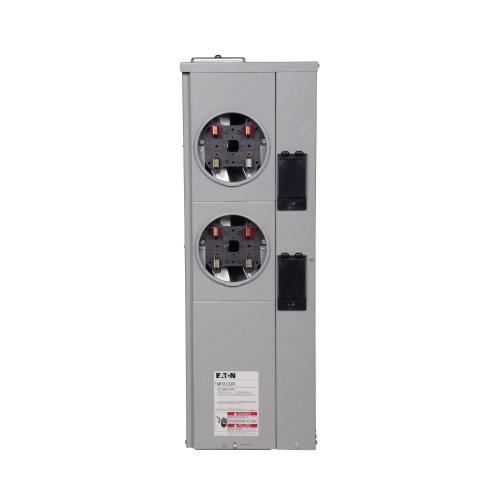 This meter pack with bondable neutral, comes self-contained for installations that require up to six meter socket positions in a single enclosure. It has provision for 2-Pole breaker. This meter pack features underground incoming feed. Ring style meter pack is UL listed.